Fluoride is a colourless, naturally-occurring mineral that can be found throughout the Earth’s surface. It can be found in solid, liquid and gas forms and, when applied in small doses, has been proven to strengthen teeth and prevent tooth decay. It’s for this reason that fluoride is often added in very small doses to the drinking water of municipalities as it has been proven to prevent cavities when compared to areas without fluoridated drinking water. The City of Toronto has added fluoride to its drinking water since 1963. If you have been to our office at Museum Dental lately for a routine dental checkup, you likely experienced a concentrated fluoride treatment which usually comes in the form of a flavoured foam and is applied to your teeth using dental trays. Fluoride protects teeth in a few different ways. One way is by strengthening the structure of the tooth for small children, which is still in the developmental stages for their teeth enamel. If the right amount of fluoride is applied during this period, the actual structure of the enamel is strengthened and becomes more resistant to acids. This means that, as the child grows, they will have teeth that are better protected right from the beginning. Having a regular dental checkup every six months is also extremely important, not just because your mouth will be professionally cleaned, but also because you should receive a concentrated fluoride treatment each time. The treatment may come in the form of a flavoured foam or gel that is applied using dental trays or it may just be a rinse. What if I’m still unsure about fluoride? If you want to learn more about how fluoride can help to protect your teeth or if you’re unsure about how much you really need to have in your diet, make an appointment with us at Museum Dental and our team of dentists and hygienitst will be more than happy to discuss it. The dental professionals at Museum Dental will assess your oral health, your dental habits and specific needs, and will give you advice that is tailor made for you! Sugary foods and drinks should be consumed only with meals. Saliva production increases during meals and helps neutralize acid production and rinses food particles from the mouth. Limit between-meals snacks. If children crave a snack, offer them nutritious foods. If your children chew gum, choose sugarless with xylitol or recaldent. Chewing sugarless gum after eating can increase saliva flow and help wash out food and decay-producing acid. Monitor beverage consumption. Instead of soft drinks or power drinks, children should drink water or low-fat milk. Help your children develop good brushing and flossing habits. Parents should assist their children until age 10. Propel Excelleration is an innovative accelerated option that fast tracks patients’ invisalign orthodontic treatment. Excelleration allows patients to achieve excellent orthodontic results in half or less of traditional treatment time. Propel Excelleration reduces the amount of time patients are in braces or clear aligners by working with the body’s own natural biology to stimulate the bone surrounding the teeth, helping the teeth to move faster. The simple 3-step in-office treatment is performed in minutes by the doctor and is done during a patient’s regularly scheduled appointment. The “Propel Excelleration” process yields minimal or no discomfort to the patient and requires no recovery time so normal daily activities can be resumed immediately. Results from patients who have already received Propel Excelleration have been exceptional. Whether patients are looking to prepare for their wedding day, an upcoming graduation, or just simply want to finish treatment sooner, Propel Excelleration will help give them that beautiful smile in faster time. Beware of “Sugar-Free” sodas, candies and sport drinks. Sugar isn’t the only dental risk factor in modern comfort foods and beverages. Recent research findings published in the Australian Dental Journal (http://www.oralhealthcrc.org.au/sites/default/files/Dental%20Erosion%20Briefing%20Paper_FINAL2015.pdf ) show that the chemical components of “Sugar-Free” drinks and candies can be just as harmful to teeth as products with sugar. Many beverages and candies contain a large amount of acids that can soften the surface layer of tooth enamel that can lead to accelerated wear and erosion. •Drink more water (preferably flouridated), particularly between meals. •After eating or drinking acidic products, don’t brush your teeth right away as this can remove the softened tooth layer. Instead, rinse your mouth with water and wait one hour before brushing. •Limit the intake of soft drinks, fruit juices, sports drinks and diet drinks. •If drinking acidic beverages, do so at meal times. •Chew sugar-free gum (particularly one with bioavailable calcium phosphate) - this can stimulate saliva flow, rinse away acids, and re-harden softened enamel. •Have regular check-ups with your oral health professional. People who believe they are at risk of dental erosion can talk to their oral health professional about using a remineralising treatment to replace lost calcium and phosphate. Is your child a thumb-sucker? Many psychologists believe that thumb sucking is normal behaviour. Unfortunately, it may lead to dental problems if continued for several years, especially after the age of six when adult teeth begin to appear. The most common effect is protrusion of the upper front teeth. With constant pressure from the thumb, they may angle outward instead of growing straight down and may cause a change in their appearance. Braces or orthodontic work are often needed to correct this. A deeper or higher palate may be created by continual pressure for the thumb since bone is soft during the formative years. Breathing patterns may also be altered because of changes in the palate. Many mouth breathing adults were thumb sucking children. Thumb sucking may be a difficult habit to break. Parents should first try talking with their child and help from your dentist may be needed. If these attempts fail, you may consider trying a mouth appliance specifically designed to prevent thumb sucking. Any loss in your child's gratification from thumb sucking will be outweighed by the benefits of a healthier, more functional mouth. The extent and severity of inflammatory gum disease is closely related to heart attack severity, new research published in the Journal of Dental Research suggests. “Chronic periodontitis appears as a "death risk factor", and it plays an important role in the prognosis of acute myocardial infarction (MI),” according to a recent study from the University of Grenada, Spain. However, follow-up checks are needed to monitor for any new coronary events, cardiac failure, or death among the participants, according to the research team. If that happens to be the case, chronic periodontitis should be considered as a predictor in the development of MI, and be therefore included in the risk scores for better understanding whether those patients may actually have a higher incidence of fatality from heart attack. It's been a while since our last blog post but we promise the wait was worth it! Dr.Philip Walton explains gingival depigmentation to us! Although most people think of healthy gums being pink in colour, there are actually many variations that can exist. A number of race/ethnicity have darker gums which is commonly referred to as gingival hyper-pigmentation. This is most commonly found in Asian and African populations and tends to present itself with shades of brown or purple hues. The reason for this discolouration or darkening of the gums has to do with an increased presence of Melanin cells which are responsible for various skin tones as well. Although discolouration of the gums does not pose a health issue, there are many individuals who tend to be self conscious about the appearance and desire improved aesthetics. Until recently - it was believed that gingival pigmentation could not be altered. In fact - many so-called aesthetic surgeons or dentists in Beverly Hills have began to market high cost and unpredictable solutions for patients who are quite desperate to change their gum appearance. In reality - newer methods which are undertaken with great ease are now available and can provide substantial improvement in the aesthetic appearance of pigmented gum tissues. These procedures are typically undertaken with just local anesthesia - similar to getting a filling done. The procedure is painless and can take as little as 20 minutes depending on the severity and extent of the hyper-pigmentation. Patients typically return to work the same day and daily routine/lifestyle continues unaltered. Mild soreness in the first few days is the only side effect to be expected. Here the patient is seen at less than 1 week following the upper being completed. This case was performed by Dr. Phil Walton and represents his years of training and is not be used without permission. X-ray exposure is reduced by up to 85% compared to traditional film processed techniques. We are able to use computers to capture, store, and transmit dental x-rays in an eco-friendly way without using film and chemicals. Images are available almost instantly on the computer screen. Many diseases and conditions of the oral cavity (regarding teeth, surrounding tissues, and bone) cannot be seen in a visual exam of your mouth. Early detection of dental conditions and problems saves time, money, and unnecessary discomfort. Digital x-rays can also help prevent more serious dental and health problems. Because the images are stored on the computer, we can print or copy digital x-rays. We can send images to dental specialists when patients are referred to them. We can also electronically send images with treatment estimates to insurance companies to expedite assessment and approval of dental benefits. Additionally, technical errors often can be corrected to provide an optimal x-ray without having to make another x-ray exposure. New digital x-rays can be compared easily with past x-rays to see “if” and “how” conditions have changed. As always, precautions are taken to limit your exposure to radiation from x-rays. Modern equipment limits the size of the radiographic beam to approximately the size of the sensor being used and patients wear a leaded apron and thyroid shield as the x-ray is taken. Dr.Bulger answers your questions on x-rays! We welcome your concerns, encourage your questions, and strive to keep you informed about dental care. During my discussions with patients, a few have expressed their concerns about dental X-rays. I would like to address some of these concerns and share this information with you. Dental X-rays are necessary for accurate diagnosis of many dental conditions. They allow dentists to detect decay and diseases of the mouth, bone, face and jaw that may not be visible during an oral examination. X-rays help us detect dental conditions early and they play an important role in the diagnosis, treatment, and prevention of dental problems. Modern equipment filters out unnecessary radiation and focuses the X-ray beam to a very small area of interest. Our high-speed digital sensors and protective collars and aprons further reduce our patients’ exposure. With these safeguards in place, the small amount of radiation you are exposed to from dental X-rays generally represents a much smaller risk to your health than an undetected and untreated dental problem. I hope this information assures you that we are committed to providing competent and quality care to our patients. Please feel free to contact us at office number to ask us about X-rays or any other aspect of your dental treatment. Thank you again for choosing MUSEUM DENTAL. Dr. Michael Bulger and the Museum Dental team. TGIF! We know everyone's excited for the weekend but we couldn't let the weekend start without posting some dental tips! Being a parent is a full-time job. As your family dentist, it's my job to send preventive dental care reminders about how to care for your child's developing teeth and gums. Infants should finish their bottle or breastfeeding before going to bed. Frequent and prolonged exposure of a baby's teeth to liquids containing sugar, like sweetened water, fruit juice and potentially milk, breast milk and formula is a risk factor for early childhood caries, sometimes called baby bottle tooth decay. Do not dip pacifiers in sugar or honey. Wipe the baby's gums with a wet gauze pad or with a washcloth or towel after each feeding. Begin brushing your child's teeth with water as soon as the first tooth appears. Your child's first dental visit should occur within six months of the eruption of the first tooth and no later than the baby's first birthday. Aggressive thumb sucking may cause problems with children's primary (baby) teeth, so please mention to me on your next visit if your child has this habit. I can check his or her mouth for any changes and give you techniques to help curb thumb-sucking. As baby teeth erupt, your child may become fussy, sleepless or irritable. One way to comfort your baby is to gently massage the gums with a clean finger, a small cool spoon, or a clean, wet gauze pad, washcloth or towel. Consult with your pediatrician, family physician or dentist on the most appropriate water to use in your area to mix with infant formula. As always, we are here to answer your questions, so please feel free to call our office at 416-922-6848 to schedule your first “well-baby” dental appointment. Refreshing summer drinks that won’t stain your teeth and relieving mosquito bite itches! Happy summer to everyone from Museum Dental! It’s summer time and while many of you escape up north to cottages and enjoy the break, you return to back to the city with black fly bites and mosquito bites along with the extreme itch that is unbearable. Well, the staff at Museum dental, along with of one of our patients have stumbled upon a great remedy to relieve that sting and itch from insect bites. Pro Namel toothpaste! Yes, this fabulous toothpaste which is great for your regular brushing has been found to immediately stop the itch on an insect bite. Why you ask? We aren’t exactly sure but we are researching it. In the mean time enjoy the outdoors and caring around a small tube of Pro Namel toothpaste in your pocket for that quick relief. Now comes the fun part of this post! Looking for delicious, refreshing, summer drink recipes? Drinking intensely coloured drinks is the biggest contributor to stained teeth. The darker the drink colour, the greater potential there is for staining. Here is a list of some of our favourite summer drinks that will not only taste delicious, but will also help keep your teeth sparkling white all summer long! Does frequent snacking present problems for our teeth? Well, it depends. Every time we eat, our mouths go to work cleaning things up and restoring “balance”. Protein-rich foods like beans, meats, and eggs have phosphorus and minerals that help build strong teeth. Do you have smart snacking tips of your own? We’d love to hear them! For some people, visiting the dentist can be a stressful experience. Millions of people experience anxiety at the thought of an upcoming dental visit and end up postponing their appointment. At Museum Dental, we want to assure you that we understand this anxiety and want to make your visit as pleasant as possible. Tell your dentist and the dental staff if you feel fearful, tense, or anxious. Talking about your fears can help your dentist tailor the treatment and pace to suit your needs. Try to schedule your dental visit for a time when you won't be rushed or physically strained. You may find a Saturday or early morning appointment less stressful than rushing to see the dentist directly after work. Arrange a signal ahead of time with the dental staff, such as raising your hand, to indicate you are feeling discomfort or need a break from a procedure. Bring some music to listen to during your treatment. Try visualization. Focus on a relaxing scene from a favorite vacation spot and keep it in your “mind's eye” during the visit. Please talk to the dentist about medications that are available to help create more relaxed, comfortable dental visits. The type of procedure, your overall health, history of allergies, and your anxiety level are considered when determining which approach is best for you. Technically, cavities are caused by carbohydrates interacting with bacteria on your teeth to create acid by-products. Carbohydrates include sugars, but cavities can just as easily be caused by crackers, potato chips, and bread! Kids are NOT inherently more prone to decay… They’re just not as good at brushing! Teach your child thorough brushing techniques—helping them out until they’re dexterous enough to do a good solo job. Decay can eat clear through your enamel and dentin before some people feel it at all! Catching tooth decay early typically allows more of the tooth to be saved, and can spare you added discomfort and expense. That is why it is important to see us regularly so we can detect early cavities and fix them. As your dentist, I view myself as a member of your personal oral health team. The most important factor in your success of having no cavities and healthy gums is how well you practice good oral care at home. * Brushing and Flossing: Brushing your teeth twice a day with a CDA accepted fluoride toothpaste and flossing your teeth once a day is essential. Patients often say that they just don't have time to floss. You can floss your teeth at any point in the day. Flossing is easier than ever thanks to the variety of flossing products, such as inter-dental cleaners, floss picks, and power flossers. These healthy habits are worth incorporating into your daily life. * You Matter- Nutrition Matters: Your choice of foods and beverages is another key to good oral health. Eat a balanced diet and limit between-meal snacks. A steady diet of sugary foods and drinks, including sports drinks, can ruin teeth, especially among those who snack throughout the day. Sugar mixes with the bacteria in your mouth to produce acid. This acid attacks the enamel on your teeth for up to 20 minutes. When sugar is consumed regularly, the harmful effect on teeth can be dramatic. Once a tooth decays, the enamel does not grow back. The only option when decay occurs is to see me to have the tooth treated. * Stop Smoking! Smoking or using tobacco in any form also damages your oral health. Not only does smoking and chewing tobacco place you at higher risk for cancer and other life-threatening diseases, but tobacco use can also cause periodontal (gum) disease. If you smoke and you are interested in quitting, we can talk about available treatment options and determine the best course of action for you. * Regular Preventive Dental Visits: Even if you thoroughly brush and clean between your teeth each day, your teeth need professional cleanings at the dental office. Professional cleaning helps remove stains, plaque, and tartar from your teeth to keep your smile bright. 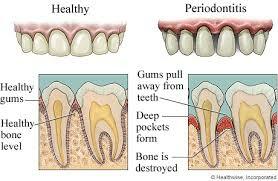 It also helps prevent periodontal (gum) disease. Early detection of oral health changes help to stop issues before they become problems. By taking care of your teeth, eating a balanced diet and having regular dental visits, you can have healthy teeth and an attractive smile for life. If you have any questions or concerns, please do not hesitate to contact us at 416-922-6848. How to prevent bad breath! This week's blog was written by Dr.Bulger giving up tips on how to prevent bad breath! Halitosis, or bad breath, is an embarrassing problem that nearly everyone knows, yet few care to talk about. Our office can help you get to the bottom of this problem and provide simple solutions to prevent bad breath. Bad breath has many causes: odor-causing foods, tooth decay, gum disease, bacteria growing on the tongue, dry mouth, use of tobacco products, sinus or respiratory infections, some medical disorders, improperly cleaned dentures, inadequate oral hygiene, or some medications. We can help find the cause of bad breath and if it's due to an oral condition, we can set up a treatment plan to eliminate this problem. Treatment may be easier than you imagine. 1. Schedule regular dental visits for a professional cleaning and checkup. Keep a log of what you eat. Avoid constant use of breath mints and other hard candies containing sugar. They will only temporarily mask bad breath and can lead to tooth decay. 2. Make a list of over-the-counter and prescribed medications that you take. Some may play a role in causing bad breath. 3. Look for oral hygiene products that display the CDA Seal of Acceptance, a symbol of safety and effectiveness. 4. Brush twice a day with a CDA accepted fluoride toothpaste to remove food and plaque. Brush your tongue, too. Once a day, use floss or an inter-dental cleaner to clean between teeth. 5. If you wear removable dentures, take them out at night. Clean them thoroughly before putting them back in your mouth the next morning. 6. If you feel you must constantly use a breath freshener or mouthwash to hide unpleasant breath, see me so we can get to the root of the problem. Benefits of chewing sugarless gum! We have another informative post from Dr.Christakos about the benefits of sugarless gum and why you should be chewing it more often.